Mission Statement: The Leading Creek Watershed Group is a partnership of residents, officials, and agencies united by common interest in restoring the Leading Creek Watershed to add to the quality of life for the residents of the watershed and surrounding communities. Leading Creek flows a distance of about 30 miles through most of the western half of Meigs county, as well as smaller parts of Athens and Gallia counties. Leading Creek empties into the Ohio River near Middleport. Almost 70% of the watershed is covered in forest. Much of the rest of the land is used for agriculture. There are over 2,000 acres of unreclaimed strip mines in the watershed. 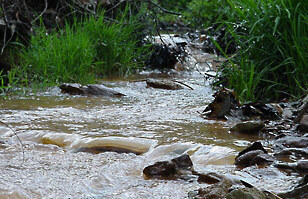 Because of this problem, acid mine drainage (AMD) affects more than 20 miles of streams in the watershed. In addition, pollution from agriculture, wastewater, nutrients, and sedimentation due to abandoned mines and stream bank clearing is evident throughout. The Leading Creek Improvement Account was formed after a disaster took place in 1993. The Southern Ohio Coal Company’s #31 Mine flooded due to a ruptured mine seal, sending over 1.1 million gallons of toxic water down Parker Run and into Leading Creek. After the incident, the macroinvertebrate, amphibian, and fish populations in Parker Run were decimated. The Meigs Soil and Water Conservation District has an elected Board of Officials that is ultimately responsible for the effort to restore Leading Creek. However, the Leading Creek Improvement Committee (LCIC) has provided technical expertise to aid in the Board’s decision making. A local watershed group has proven difficult to form in this area because of the poverty of the surrounding communities, their small populations, and the fact that the water is not severely polluted. However, many landowners have been supportive of the Leading Creek Watershed Group’s efforts.